You have added Encircled In Style Lace Dress in Black/Ivory into shopping cart. FINAL SALE. The bold lace fabric on this dress is unique and stunning--we love the cutout circle designs! The Encircled In Style Lace Dress is fully lined in ivory. It has black mesh lace overlay with circular cutouts throughout, creating a dramatic look. The wide shoulder straps, V neckline, and fitted cut combine to make an effortlessly classy dress that is perfect for any upcoming cocktail party or dinner date. Contrast fabric piping at the bodice and a hidden back zipper complete this look. The Encircled In Style Lace Dress would look nice paired with black pumps or strappy heels and a bold black and ivory clutch. Details: Fully lined. Hidden back zipper. 90% nylon, 10% spandex. Dry clean. Do not bleach. Do not tumble dry. Do not iron. Small measurements: Length from top of shoulder to hemline: 34". Bust: 31". You have added Encircled In Style Lace Dress in Black/Ivory into Wishlist. You have added Encircled In Style Lace Dress in Black/Ivory for Stock Notification. You have set Encircled In Style Lace Dress in Black/Ivory as a loved product. 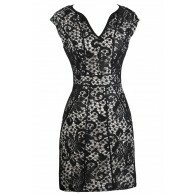 You have removed Encircled In Style Lace Dress in Black/Ivory as a loved product.